A warm welcome to all of you to the Chinese Embassy on this golden autumn day! First of all, I would like to extend my warm congratulations to the APPCG on your new leadership elected recently. I am pleased to see there are now five more vice Chairs, including the first British MP of Chinese heritage, Mr. Alan Mark. This shows the growth of APPCG not only in numbers but also in strength and representation. I hope that the APPCG under the leadership of Chairman Graham and the vice Chairs will continue to play an active and constructive role in advancing China-UK relations and especially parliamentary exchanges between our two countries. Today, we are gathering on a very special occasion. Exactly tomorrow a year ago, President Xi Jinping made a very successful "Super State Visit" to the UK and unveiled the "Golden Era" of China-UK relations. Our two countries have decided to jointly build the global comprehensive strategic partnership for the 21st century. One year on, despite of the changes and uncertainties brought up by the Brexit referendum, the fundamentals of the China-UK relations remain solid. The momentum of our relations remains strong. And the outcomes of President Xi's visit are continuing to be implemented. Last month, Prime Minister May was in Hangzhou for the G20 Summit where she had a successful bilateral meeting with President Xi. I had the honour to be present. During the meeting, the two leaders reaffirmed their shared commitment to the "Golden Era" of China-UK relations and to bringing the global comprehensive strategic partnership between our two countries to a higher level. This marks the stable and smooth transition of China-UK relations after Brexit and the British government reshuffle. 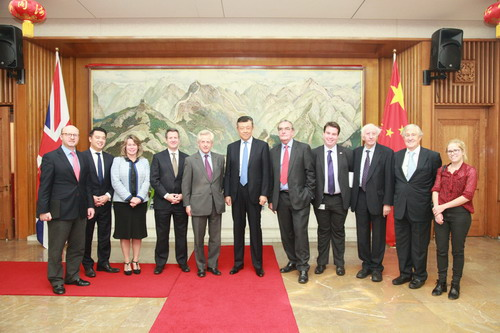 Not long ago, China, Britain and France signed the package deal of the Hinkley Point C project, which is a solid step forward in our mutually beneficial cooperation. 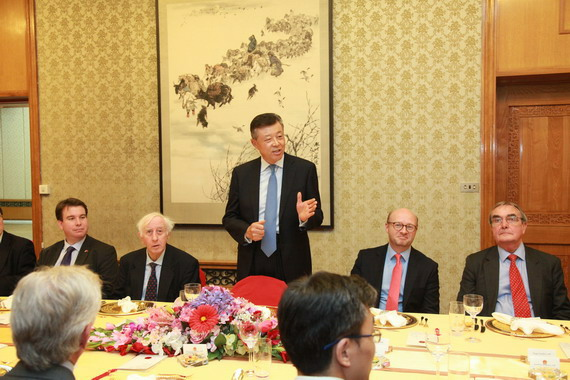 In the coming months, China and the UK will co-host a series of high-level dialogues, including a new round of Economic and Financial Dialogue and the meeting of the High Level People to People Exchange Mechanism. Our two sides are also in close consultation on the timing for a new round of Strategic Dialogue. With our concerted efforts, I have every reason to expect more "golden fruits" in the "Golden Era". Although you are from different constituencies and represent different parties, you share one thing in common. That is you all support a stronger China-UK relationship. The British political parties you represent have all made their positive contributions to China-UK relations over the past decades. Today, you are all the more engaged in advancing our ties. I would like to pay my respect and thanks to all of you. 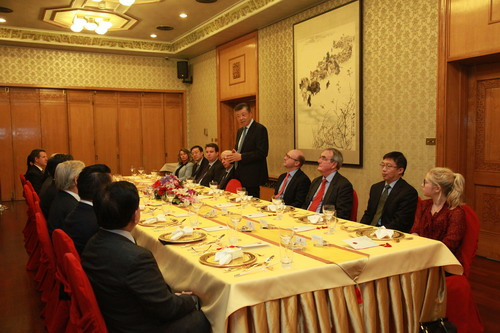 I hope you will continue your efforts and make new contributions to China-UK relations. My Embassy and I are always ready to enhance the exchanges and cooperation with the APPCG. Let's work together for a better, stronger China-UK global partnership and contribute our parts to the "Golden Era" of China-UK relationship.